I had been so looking forward to getting starting on my Wild Atlantic Way Road Trip. As I mentioned before, I live in Kerry so much of Cork, Clare and Limerick and of course all of Kerry is easily accessible for me. I decided to start in County Cork and work my way northwards. The first Discovery Point on this route is The Old Head of Kinsale so off I headed on the road to Kinsale town. 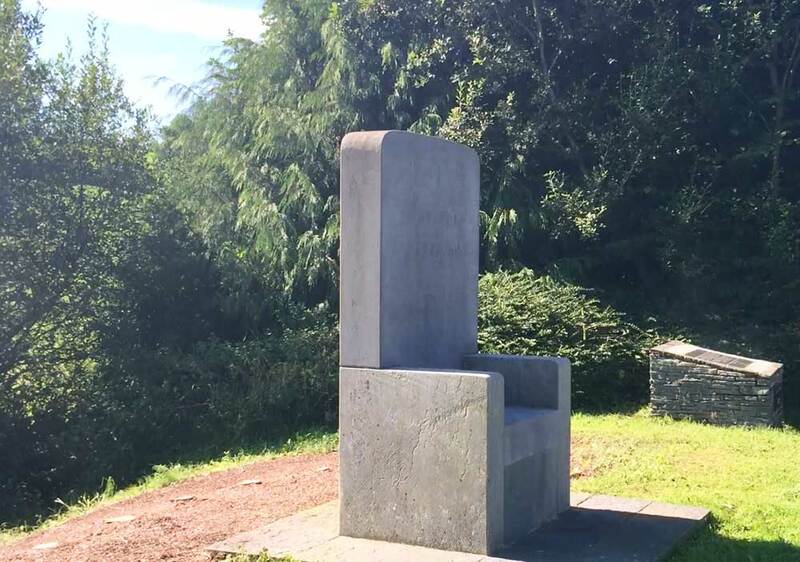 On my way to Kinsale I sought and found an intriguing Stone Chair standing at the side of the road at Millwater Crossroads about 2 miles outside the town on the R605. 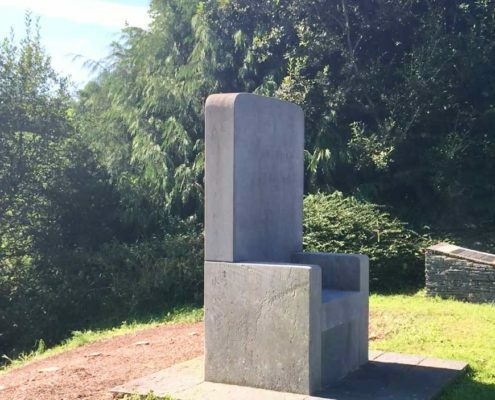 The Chair, or sculpture, is called The Stone of Destiny and was installed in 2001 to mark the site of The Battle of Kinsale in 1602. On January 1602 Irish forces were defeated by an invading Elizabethan army leaving twelve hundred dead or dying. Their blood coloured the mill stream driving the local mill causing the millers to rename the ford ‘Ford of the Battle Slaughter’. 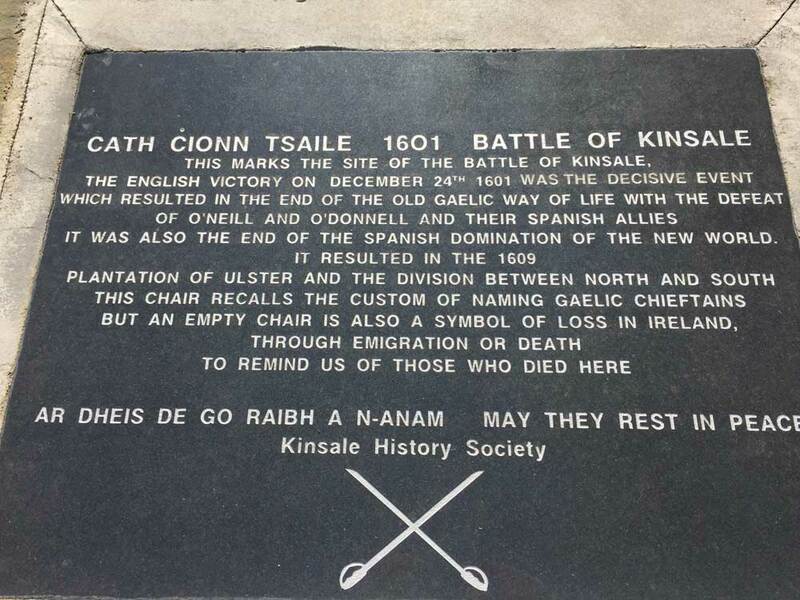 In 2001 on the 400th anniversary of the Battle of Kinsale the Stone of Destiny Chair was erected to symbolise the loss of Irish sovereignty. 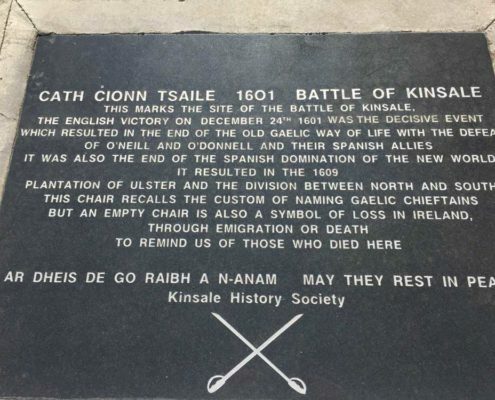 It is made of 4 stone slabs brought from the four Provinces of Ireland to represent the participation of those who joined the chieftains at Kinsale in 1602. On the sunny day of my visit it was sobering to think of the scenes that took place in this now peaceful and pleasant spot.